June 2014 – Valentina E.
NEW! 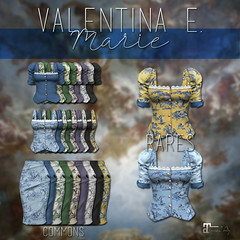 Valentina E. For July FaMESHed! Here comes the July round of FaMESHed! Check out our Sophia Two Piece Swimsuit (bottom not shown), our Sophia Summer Dress, and our Halston Belted Trousers, exclusively at this event! Valentina E. For The Dreaming Tree! NEW! Valentina E. Sophia Draped Two Piece Swimwear! Find it at our main location AND on for a special debut price of 50% off as part of The Dreaming Tree event, this weekend only! NEW! Valentina E. at Rhapsody, opening June 28th! Grab our new Halston One Piece and Halston Dress, both available in four colors, standard sizing and featuring lots of great detail. Don’t miss these gorgeous new 70’s inspired releases! Summerfest opens June 22nd! 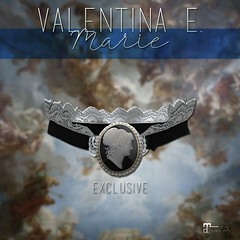 Find these exclusive Valentina E. releases only at this special event! NEW! Valentina E. Mari Dress For The Boutique! Check out our new Mari dress exclusively at The Liaison Collaborative’s Boutique event opening June 15th! This batik print dress features wooden beads around the waist and neckline. It’s perfect for summer and all of your tropical escapes! Don’t miss it….